Got a minute? That’s enough time to generate meaningful action every day of the week. Sometimes opportunities to act with mindful intention fall into your lap: the politeness jam at the four-way intersection, when everyone wants to let the other guy go first; the earnest admission from someone that moves you to respond in kind. But, let’s face it, barring an emergency, mostly our days and weeks churn by without mindful awareness of any particular moment. The funny thing is, any ol’ Wednesday is packed with choice points to notice the present and to engage. Once you start doing it, you’ll be amazed by how many opportunities there are to connect, to appreciate, and to experience— everywhere, all the time. The best part? It’s super easy to do. Just a small, simple action can help you wake up and plug in to the life pulsing all around you. Here are a few ideas to get started. When you’re going through a hard time, it can feel all-consuming, and even hurtful, that the rest of the world is just skipping along as always while your reality has been turned upside down. Yet when things are going well, we can be strangely oblivious that someone else might be experiencing the same kind of difficulty we’ve known. Is there someone in your sphere right now who is struggling? Consider what it might be like for this person to go home after work, cope with the holidays, or face some scary or challenging appointment. Is there anything you can do to help? Maybe it’s hands-on support—an offer to drive, to shop, to babysit. Perhaps it’s emotional—a note letting them know you care, a small bouquet from your garden, a call to check in. Could you also hold them in your thoughts, silently wishing for their well-being? Being a mindful listener means tuning in to the other person instead of just mentally prepping for your own commentary. But it can be difficult to do, especially if you’re not used to it. Practice this awareness-building technique in your next conversations: Before you respond to what someone has said, pause and check in with yourself. Notice your body position, your energy, any urges in your mind. Take a breath. Now, what might you add to the conversation? The next time you’re out walking your dog, taking your lunch break, or checking the mail, just for a minute, stop—and listen. Ceasing physical motion is often just enough to momentarily slow the ever-whirling mind-train, allowing your environment to come alive, like waves rolling toward shore. Wind, birdsong, city noises, construction, kids on a school playground: Let the sounds fill the sonic field of your attention. Soon enough your idle mind will come back online. But for those few delicious moments, you get to be a spectator to the whole shebang. Do you ever get into your car, start it up, and arrive at your destination 20 minutes later with no recollection of the drive? Cars encourage us to disengage from our surroundings—we close the doors and are effectively cocooned in our own little soundproof world until we get out again. It’s harder to turn inward when walking or riding a bike. Instead, you’re out there in the world, exposed to the elements, your attention drawn outward. When someone goes out of their way to be helpful, kind, and super-efficient at their job, it’s like a balm for the bumps and scrapes of daily living. It’s so easy to be a critic. (Um, Yelp much?) But do you shout from the rooftop when you have good customer service? When someone goes out of their way to be helpful, kind, and super-efficient at their job, it’s like a balm for the bumps and scrapes of daily living. Telling a supervisor not only gives deserved credit to the employee, it lets the business know what it’s doing right. Really, it takes so little effort to give a compliment, but the message can go far. They may cross your mind, but the next step is what really matters: Reach out. All relationships require tending, and regularly stretching beyond your immediate social circle is an easy reminder of how much wider our human circle is. Try this: Make a list of people you’d like to stay in touch with (your old college roommate, a retired colleague, your aging aunt, the neighbor who is going through a rough time), and post it somewhere you’ll see it every day. Then, each week, pick a name, and then drop a note, write an email, or pick up the phone and call them. You’ll feel good for nurturing the connection, and, who knows, your thoughtfulness might just be the boost the person needed that day. We’re not talking about creepily laser-beaming into someone’s eyes. Instead, simply lift your gaze and look into the face of the person handing you your latte or holding the elevator. Just for a beat, meet their eyes; maybe offer a gentle smile that says, “Oh, hello there, fellow human. I see you.” That’s it! Contact made. Good vibes shared. 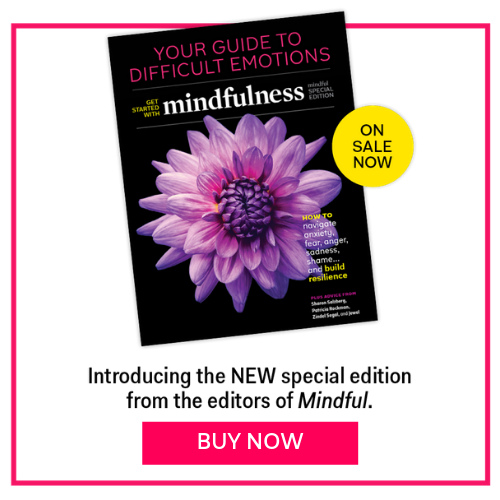 This article also appeared in the June 2018 issue of Mindful magazine.